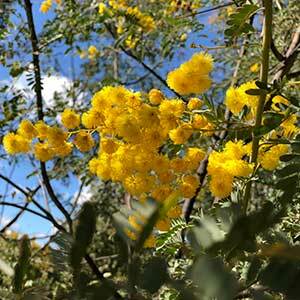 With outstanding flowers Acacia spectabilis or Mudgee Wattle as it is commonly called makes a great feature tree. It is not only the beautiful golden flowers that make this a standout, the silvery grey trunk and grey green foliage looks good right through the year. The yellow flowers begin as masses of small buds in winter they open to large golden balls, probably one of the best wattles for colour. The flowers appear in spring and seed pods follow. Landscaping uses include: Feature tree, windbreak or screening tree. This is a wattle that can be shaped, formative pruning to one central leader will give you a shade tree, general pruning after flowering will create a bushy habit. As with most Acacia, pruning back into old bare wood is not successful. The natural habitat is in dry sclerophyll forests in well drained, often gravelly soil. Best planted in full sun and a well drained soil, a little afternoon shade is OK. Deep shade will restrict flowering. Growth rate will be faster is adequate watering is carried out when first planted. Common Name – Mudgee Wattle. Origins – New South Wales. Height – To around 4 – 6 metres. Spread – To around 3 – 4 metres. Flowering Time – Winter to Summer.